Gorgeous melanistic grey seal and possibly its pup (pup looks like it's moulting to a dark pelage). The adult was a couple of hundred yards from the pup, but as the pup has started to moult it's probably weaned and the melanistic adult could be mum, ready to mate and go back out to sea. Does anyone know what the frequency of melanistic individuals is in the population (either the UK population or the global population)? 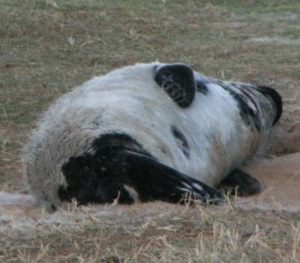 Does being melanistic disadvantage the seal in terms of hunting? I assume that the spotted/blotched pelage of most true seal species is an adaptation which breaks up the animal's outline underwater, but many eared seals have solid, sometimes quite dark coats.